Setting the record straight: do you think authors travel to exotic places to do research for their stories? Paris? Rome? The South Pacific? How about northeast Wyoming? Yep, that's where this author went. This big guy was wandering across the road in Yellowstone, stopping traffic in both directions. 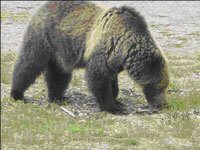 We were also fortunate to see four grizzlies; a mama with two cubs and a yearling digging in the ground for yummy moles. Our final destination was Devils Tower, a towering monolith revered by a number of Native American tribes who still consider it sacred ground. The Kiowa legend goes like this: seven sisters and their lone brother were picking berries. Suddenly the boy dropped to all fours and turned into a bear. The terrified girls climbed onto the stump of a great tree. The stump began to grow. The bear stood upon his haunches and began to score the bark with his claws. 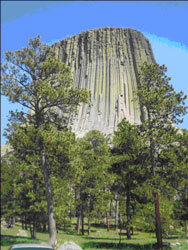 These are the vertical lines you see on Devils Tower. The seven sisters were borne into the sky and became the stars in the Big Dipper. Why did we go to Devils Tower and what could it possibly have to do with Allie Emerson, the protagonist in my Unbidden Magic series? Guess you'll have to wait another year until the final book comes out! 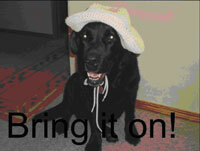 I'm hoping book 4, Shadow Moon, will be out soon. I'm still waiting to receive edits and a cover for the book. It's summer, my least favorite time of the year. Okay, here's the deal: it's too darn hot! Wanna know how I feel? Try this: put on a pair of long johns, wool socks, pants, a long-sleeved shirt and a fur coat. Now, walk around outside when it's 90 degrees out. Are you getting the picture? Is it any wonder I'm crabby? Fortunately, I've discovered an air vent in the bathroom where I can nap in cool splendor. Marilee's on her own until it's cooler. Until next time, Mauli the Muse, signing off. Love to blab about books?